Here are the top ten software suppliers with the highest profile in analyst research over the last three weeks. As you may note the top five firms still have their feet firmly on the ground. Such domineering companies seem to be maintaining a great proportion of the market and not allowing much opportunity for others to gain more of an analyst interest. 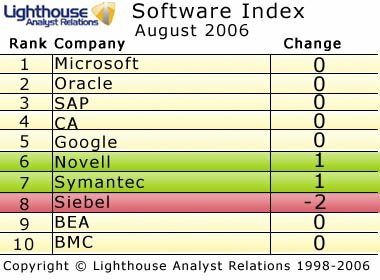 Nonetheless Novell and Symantec have gained more mentions and climed 1 position up whilst Siebel have dropped to 8th position. Although the top 10 firms in the index seem well settled, the top 25 order shows interesting movements. Genesys and Sungard are definitely the top players of analyst index this month climbing up by an astonishing 7 positions. Cognos jumps from the 20th to the 15th position whilst Citrix and VMWare show decline. SeeBeyond has shown the greatest decline in analyst interest dropping a whooping 14 places. New entrants in the top 25 league this month are Genesys and Business Objects. Mercury and Veritas on the othr hand have dropped out of the top 25.